Medusa Drinking Game was submitted by the God of Games. There’s a little bit of prep work needed with this game prepping all the shot glasses for the table. But it’s SOOOO worth it. This is a one to play as a pre-drinking game before a night out or to start a glorious night of drinking games. I recommend starting off with this game before moving onto something like Ring of Fire, Jacks or Ninja. Dig out the shot glasses… You’re going to need a lot of them. Fill up a s#!t ton of shot glasses with your favourite liquor and place them on a table. Now everyone who’s playing needs to sit around the table and prepare to drink. Everyone starts the game with their heads bowed so they can’t see any of the other players. Someone needs to count down from 3 to 1 and then everyone needs to look up and stare into the eyes of another player. If two players are looking at each other both players need to shout ”MEDUSA!” and both players need to drink 1 shot from the table. Everyone else is safe. Keep repeating this until all the shots from the table are gone. Get a crap load of shot glasses and fill them up with liquor. Everyone sits around the table of shot glasses. Someone counts down from 3 to 1. Then everyone looks up at stares into another players eyes. 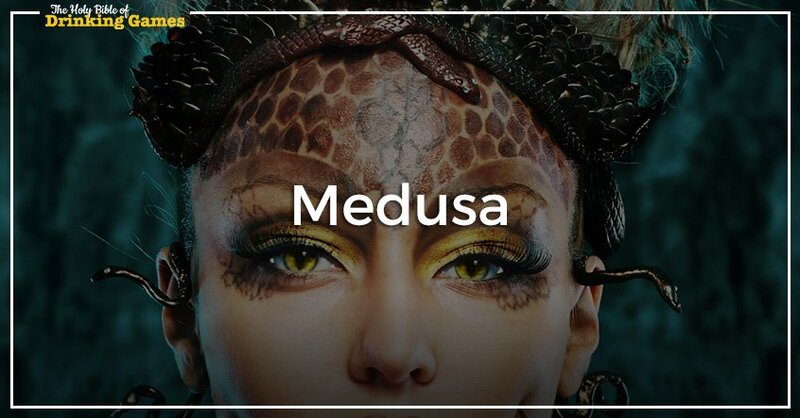 If someone is staring back into another player’s eyes both players shout ”MEDUSA!” and both players drink a shot. Keep playing until all the shots are gone.